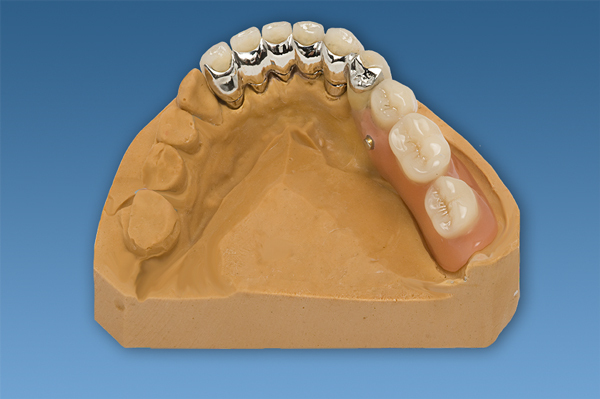 The second fundamental variation is based on the provision of telescopic crowns. These are also primarily blocked. Here, the attachment to the abutment teeth is achieved by the equally blocked secondary crowns, which are usually faced with composite. Whether to use an RSS or telescopic attachment is a matter of choice and is dependent to a large degree on the existing clinical situation. The majority of monoreductors that we make are RSS variants. The advantages are using tooth coloured anchor teeth with ceramic facings, and the retention provided by the abutments, when the denture is removed. The height of the bite is also ensured. The telescope variant gives a slightly better fixing, with an easier handling on insertion. 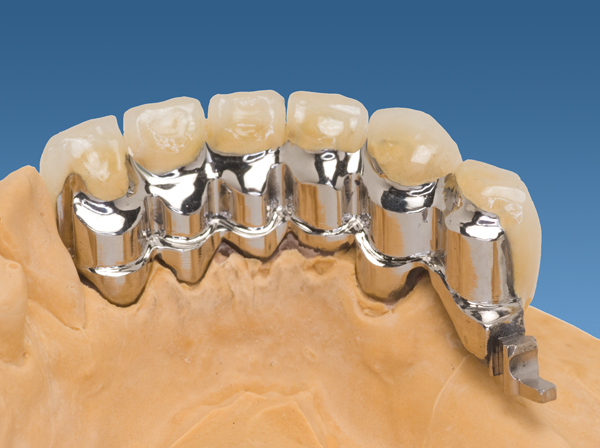 It does, however, require considerably more room due to the construction based on primary and secondary crowns. This requires a greater loss of original tooth material during preparation and there is a risk that the final monoreductor is too bulky. When the denture is removed, the primary crowns are visible as gold caps, especially in the lower jaw. From a material/technical point, we prefer a metal ceramic veneer. Demands a certain amount of dexterity and practice on insertion. Special consideration with older people! If one of the abutment teeth is lost, the denture cannot be rescued! Acrylic denture with curved metal clasps – no comment! abutment teeth, attachments, bolts, dental crown, dental Laboratory Ulrich Heker, dental Telescope, dentist, double crown, German Crown, Germany, removable denture, Removeable Bridge. Lesezeichen.